The highlight for me of San Diego Comic-Con was speaking on the BrickJournal: LEGO as an Art Form panel with Nathan Sawaya, Brandon Griffith and Joe Meno (yes, me with those three, I kept expecting men with clipboards to come up and say "there's been a mistake...") Nathan was especially entertaining and informative on the panel, and let's face it, the real star. He was well-spoken, charming and everything I'm not. 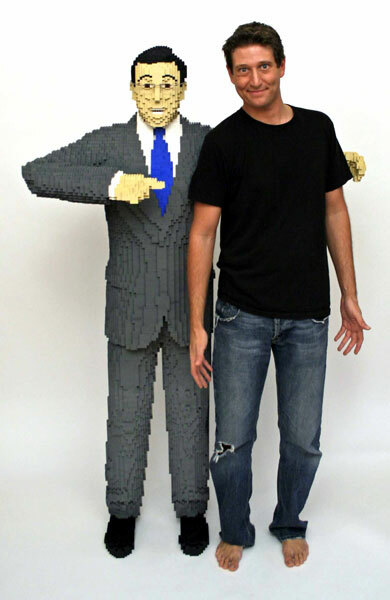 He's also one of, if not the, greatest brick artists in the world. BrickNerd is very happy to be able to let you all get to know him a little better. I used to practice corporate law in New York City. When I came home at night I would need a creative outlet. Some nights I would draw, some nights I would paint, and some nights I would sculpt. One day I challenged myself to sculpt out of this toy from my childhood: LEGO bricks. 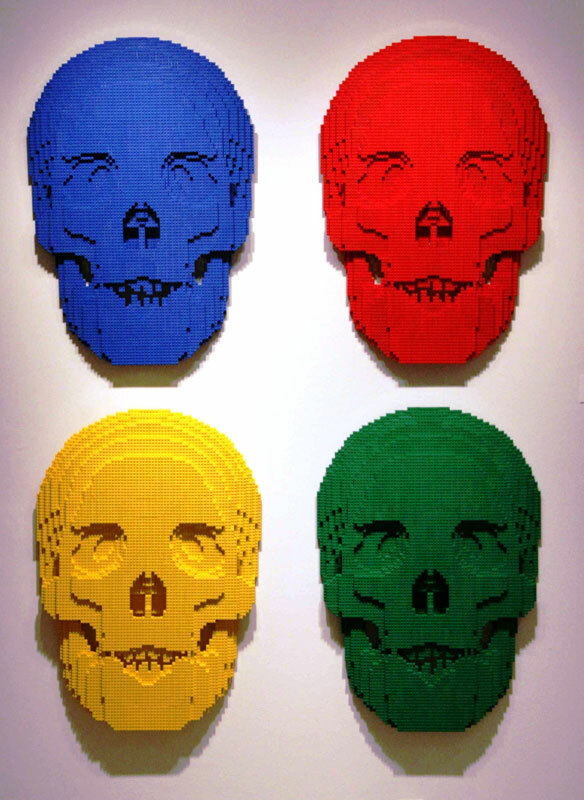 I started doing large scale sculptures out of LEGO. Most nights I would find myself snapping LEGO bricks together even before I took off my suit or ate dinner. It felt good after a long day of negotiating contracts to build something with my hands. Slowly but surely my New York apartment started to fill up with sculptures. The artwork consumed almost every room. I posted photos of the works on my website, www.brickartist.com, to showcase my artwork in a virtual gallery to friends and family. When my site crashed one day from too many hits, I realized it was time to leave the law firm and pursue my passion to become a full time artist. I quit my job as a lawyer, opened an art studio, and took the leap of faith. I like using LEGO bricks because they let me create anything I can imagine. They are a great medium for art because I can use them to build my ideas. As an artist, I wanted to elevate this simple childhood toy to a place it has never been before: into the fine art galleries and museums. I appreciate the cleanliness of the LEGO brick. The right angles. The distinct lines. As so often in life, it is a matter of perspective. Up close, the shape of the brick is distinctive. But from a distance, those right angles and distinct lines change to curves. That is what drew me to the brick. I like using the bricks as a medium because I enjoy seeing people’s reactions to artwork created from something with which they are familiar. Everyone can relate to it since it is a toy that many children have at home. But it is more than that. My favorite thing about using LEGO bricks is seeing someone be inspired by my artwork to go and pick up a few bricks and start creating on their own. I was five years old on Christmas morning. There was a present under the tree that had a tag from my grandparents and the ominous words "Don't Shake." I shook it. It rattled. I looked at my sister. She was busy with a new doll. I tore into the package, and found my first set of LEGO bricks. I opened the box and started building immediately. I want to captivate the viewer for as long as I can keep their attention. But more than that, I want to inspire people to create their own art. By using an accessible medium, LEGO bricks, I hope that I can reach as many people as possible. There are no rules to art. Because I ship art all over the world, I have learned that I must glue all of my sculptures together. (Museums get grumpy when they open a crate to find a pile of loose bricks.). Now because I glue bricks together, I have had folks tell me that I am "cheating." I don't who makes these rules, or who the referee is, but it has been often pointed out that gluing is cheating. However, there are no rules to art. In fact, there is no cheating. My niece. At age three she could make towers of Duplo bricks like nobody's business. Do you ever look back on old pieces and say "if I only…"
There are times when I look at a piece and see mistakes that may be too late to fix. But I am in the very fortunate position where I can work a great deal of time on my pieces and get them to look like I want. I have two art studios (in New York and Los Angeles) where I keep millions of LEGO bricks. I keep the pieces organized by shape and by color. I usually have two to three projects going on at once. I move from project to project depending on timing, deadlines or maybe my mood. I have used LDD to build models and concepts. It is a good way to test out ideas. I have encouraged kids to to do the same because with virtual bricks there are no limits. You can have a million virtual bricks and you do not need a garage to store them. I think my late mornings are probably the most productive. Followed by my evenings. And maybe midday. And then late evenings. But never at dawn. Yes, I like to have different types of music playing depending on what I am working on. Sometimes classical music early in the day, sometimes techno music in the late afternoon, sometimes a rousing broadway musical to get me through the tough part of a sculpture. Do you keep all your pieces? If so, do you display them? No, I have to sell some of them, because I like to eat and pay rent. Actually one of the best parts of my job is taking on commissions where I get to work with others to create their passions out of brick. As for displaying works, I am fortunate to have multiple exhibitions touring around the world. 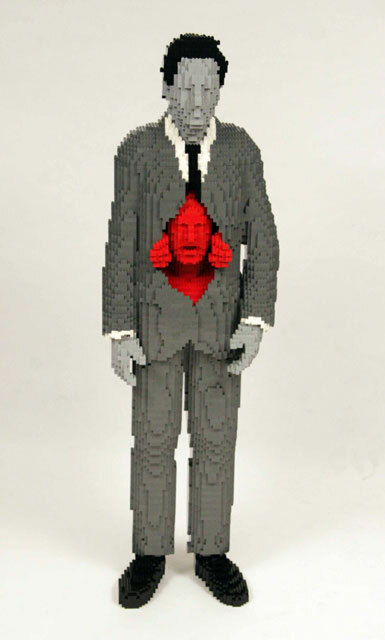 The Art of the Brick has visited several countries and continues to tour. You can find the tour schedule at brickartist.com. Main Street. 6390, not the 10041 reissue. I like that original pigtail hair on the minifig. If you could pick a single creation of yours for permanent display somewhere notable, what would it be? Which of your pieces would you say personifies you? It might be Gray, where a figure is tearing itself out of a big gray box. This piece seems to sum up my transitions in life, as I tore away from my past doings as a lawyer to find myself as an artist.